An external tankfoam-shedding problem could prompt NASA to roll shuttle Discovery back toKennedy Space Center's assembly building for repairs, but the agency still ispressing ahead with preparations for the targeted Aug. 25 launch. Senior NASA managers willgather today and Wednesday for a preliminary flight readiness review for Discovery,which is slated to flyseven astronauts on an International Space Station outfitting mission. One key issue to beaddressed: significant foam loss on NASA's past two flights from metal bracketsthat hold liquid oxygen pressurization lines and electrical cabling on the sideof the shuttle's 15-story external tank. "I suspect there willbe a good deal of discussion about this," said Kyle Herring, a spokesmanfor NASA's Johnson Space Center in Houston. NASA is facing a Sept. 3deadline to launch or delay the mission until October. A robotic Japanese cargocarrier is scheduled to launch on its debut mission to the station on Sept. 10and Russia is set to launch a crew exchange mission to the outpost around Sept.20. A recommendation to flyDiscovery as is or roll the shuttle back to the Vehicle Assembly Building forrepairs will be made on Aug. 18. Larger-than-allowable chunksof foam insulation broke free from a so-called ice frost ramp during thelaunches of Atlantis in May and Endeavour in July. On the Endeavour flight,foam chunks that weighed about 0.044 pounds -- or about doublethe allowable amount -- broke free from a bracket high up on the shuttle'sbullet-shaped tank. 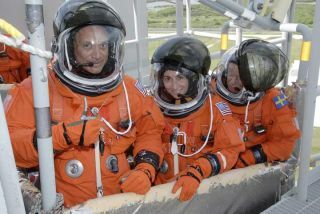 The concern is thatbreakaway foam could do critical damage to shuttle wing panels or thermaltiles, which protect orbiters and astronauts from extreme heat duringatmospheric reentry. Columbia and its seven-membercrew were lost in 2003 when a 1.67-pound chunk of foam broke free 81seconds into flight, blasting a 6- to 10-inch hole in its left wing. Hot gases blowtorchedthrough the hole during atmospheric reentry, leading to the disintegration ofthe spaceship 16 minutes before a planned landing here at KSC. Endeavour's tank also shedan unusual amount of thin foam from a ribbed center section during its July 15launch. NASA engineers say an adhesive failed to bond properly with a substrateprimer on the aluminum lithium skin of the tank. More than 150 tests wereperformed on that area of Discovery's tank prior to its move last week tolaunch pad 39A. That problem is not expected to delay Discovery's launch. NASA engineers still aretrying to determine the root cause of the foam loss from the ice frost ramps.Each tank is equipped with 34 of the metal support brackets. Foam insulationapplied to them smoothes airflow over the brackets and prevents ice build-ups. Herring said the suspectramp on Discovery's tank has no known flaws. Special high-tech x-rays uncoveredno cracks or voids during extra testing prior to Discovery's move to the pad,he said. Published underlicense from FLORIDA TODAY. Copyright ? 2009 FLORIDA TODAY. No portion of thismaterial may be reproduced in any way without the written consent of FLORIDA TODAY.